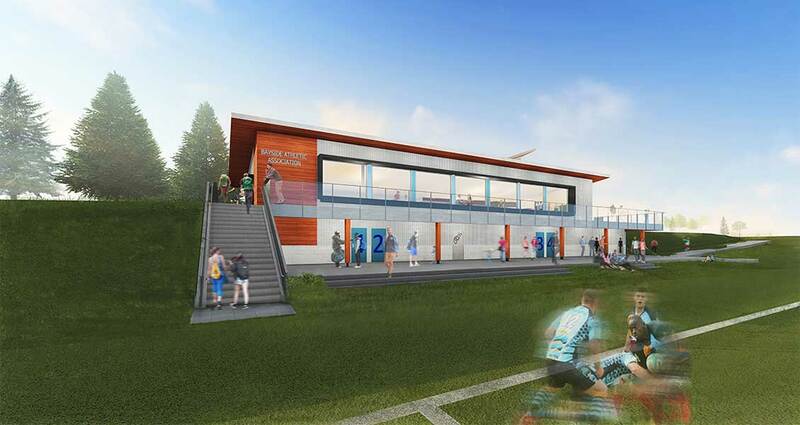 Thinkspace has been retained to construct a Rugby Fieldhouse at the South Surrey Athletic Park for the City of Surrey. It will be a shared facility with the Bayside Athletic Association, a local rugby club. The facility will have four change rooms, public washrooms, referees room, first aid room, and a rugby field house/activity space, to be constructed at a later date, combined in a two storey building. The building will be an extension of the existing baseball batting facility. The project is divided into two parts, to be constructed in two phases. Phase One will consist of the construction of the semi-heated lower level with four change rooms and washrooms, a referee room, a first aid room, storage space, a mechanical space, and two public washrooms. The upper level shell will also be part of this phase. Phase Two will be the fit-out of the second floor for the Bayside Athletic Association. This will include an activity space, washrooms and a non-commercial kitchen. Provisions have been made during Phase One to allow for these the tenant improvements. In addition to the proposed Fieldhouse construction, new field access will be provided and some minor upgrades to landscaping will occur.